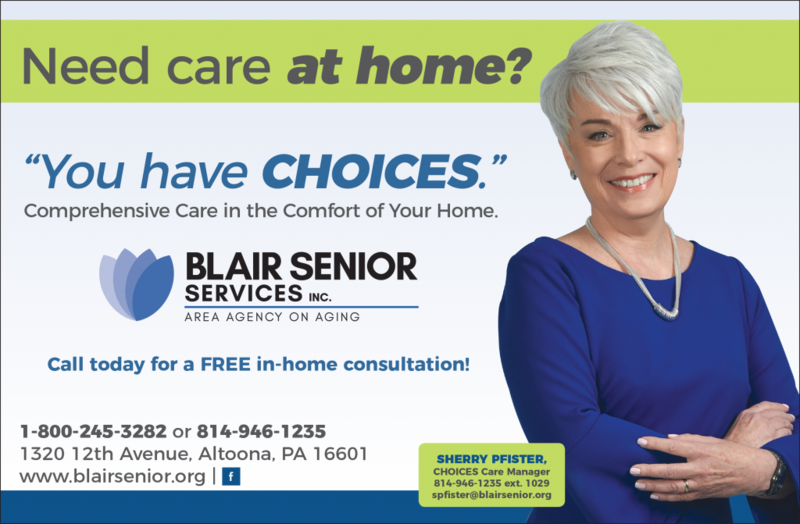 CHOICES is the first program of its kind offered by an Area Agency on Aging in Pennsylvania. CHOICES services are available to older individuals in our area and are paid for by the participants or their loved ones. Our CHOICES staff assures that all of the workers providing assistance have had thorough background screenings and hold the appropriate qualifications for the service they are providing to the participant. Robin Eiche has been a CHOICES consumer for the past six years. With the help of CHOICES, she hopes that she can stay in her own home for the rest of her life. At 94 years young, Elsie Kidwell has been using CHOICES for several years. She started using CHOICES for assistance with shopping, but that grew into assistance with meals, getting ready for the day, and transportation to church and medical appointments. Through CHOICES, she even has a nurse who manages her medications, calls in prescriptions, takes her vitals, and communicates with her doctors. Finding help and assistance when you want and need it is difficult. That’s why thousands of seniors turn to Blair Senior Services, Inc., Blair County’s trusted Area Agency on Aging. Our CHOICES Program is an affordable option to help you live comfortably at home, while still receiving assistance if you need it. All of our services are arranged by your CHOICES Care Manager so you do not need to worry about scheduling, cancellations, or coordination of services. Care Managers are trained to assess and recommend any service that may benefit an individual, not simply those services available through the CHOICES Program. You choose only the services that are specific to your lifestyle and your needs. Having CHOICES Means Assistance With the Tasks of Daily Life! Your CHOICES Care Manager can help you with small ‘odds and ends’ in your home like changing light bulbs and furnace filters. Have a pet? Let us help with vet visits or other pet needs for you. Taking care of a home can be difficult and we are here to help! Spend more time with your loved ones and less time doing household chores or heavy cleaning. We can even help you store/unpack your clothing or organize your closets. Services are available monthly, weekly, or even daily and tailored to the work you would like completed. You can stop worrying about tracking and paying bills. With our personalized financial services, we can assist in maintaining your checkbook, taking you to the bank, reconciling monthly bank statements, or paying bills. A financial assistant will visit with you in your home to determine your unique wants and needs. Our agency ensures that your financial information will be kept in the highest confidence. If you want or need someone close by to go with you to the beauty shop, out to lunch, or just be a friend, we can provide a companion to join you for the day. We can be flexible with your schedule and provide you with someone to accompany you whenever you need it. You can keep your personal independence and freedom and let us do your grocery shopping and personal errands. We will gladly accompany you to the store and help carry your bags, or simply give us your list and enjoy yourself while we complete the shopping for you. You will not be alone when recovering from a hospitalization or illness. We can prepare meals, change linens, monitor your medications, help with your personal care, and be there to comfort you during recovery. Nursing and Medication Management LPN or RN services can be provided conveniently in your home. Medication Management services include a nurse to call and arrange for medication refills, communicate with your physician, fill your pill planner and monitor your blood sugar and other aspects of your health if necessary. Your CHOICES Care Manager can arrange for sick calls from nurses and can even have a nurse conveniently complete lab work in your home. Call Sherry Pfister or Jessica Lego, CHOICES Care Managers, for more information today! Sherry can be reached at 814-946-1235, ext. 1029 or email spfister@blairsenior.org. Jessica can be reached at 814-946-1235, ext. 1030 or email jlego@blairsenior.org. Choices at Blair Senior Services, Inc.